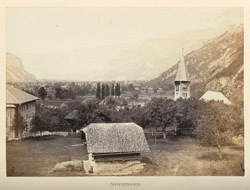 British photographer and publisher of continental views Francis Frith spent 6 weeks following the course of the Rhine and stopping at tourist sites in Switzerland, Austria and Germany. His photographs illustrate scenes from Henry Wadsworth Longfellow's novel Hyperion. In the text accompanying this view Longfellow's fictional hero Paul Flemming "looked southward upon a beautiful landscape of gardens, and fields of grain, and woodlands, and meadows, and the ancient castle of Resti, looking down upon Meyringen. And now all around him were the singing of birds, and grateful shadows of leafy trees, and sheeted waterfalls dropping from the woodland cliffs, seen only, but unheard, - the fluted columns breaking into mist, and fretted with frequent spires and ornaments of foam, and not unlike the towers of a Gothic church inverted...Yet he was weary with the day's journey, and entered the village of Meyringen, embowered in cherry-trees, which were then laden with fruit..."